The Testing Program is a Spanish-language instructional and assessment platform that focuses on critical skills related to successful use of the Microsoft Office and Adobe Creative Cloud suite solutions (Word, Excel, PowerPoint, Flash, Dreamweaver and Photoshop). The Testing Program provides thousands of learning objects organized and sequenced for each of the software applications and provides robust assessment of learner competencies. Educators using the program have access to a teacher portal that allows them to assign specific skills to individual or student groups and generate individual and group reports indicating student results and summaries of student performance. 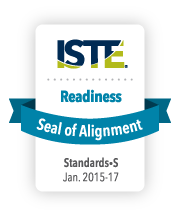 The Testing Program received the ISTE Seal of Alignment review for Readiness. Reviewers determined that this resource helps build and assess foundational technology skills needed to support the ISTE Standards for Students. As an assessment program, the Testing Program introduces learners to the basic skills needed to operate MS Office and Adobe Creative Cloud suite programs and assess a learners’ core competencies. The broad array of skills addressed within the program provides a solid foundational core within each program, and together these skills serve as a strong foundation for serious application in lessons, projects and other classroom activities. 6.a. Understand and use technology systems.